Jennifer Ashton, M.D., is a doctor, mother, and friend who has witnessed firsthand the impact of a loved one’s suicide. When her ex-husband killed himself in February 2017 soon after their divorce, her world—and that of her children—was shattered. Though she held a very public position with one of the world’s largest media companies, she was hesitant to speak about the personal trauma that she and her family experienced following his death. But with the high-profile suicides of Kate Spade and Anthony Bourdain in 2018, Dr. Ashton recognized the importance of talking about her experience and the power of giving voice to her grief. In a quest to provide comfort and solace to the countless others who have had to face the aftermath of suicide, she first shared her story with her Good Morning America family on air in an honest and heartbreaking interview. This May, William Morrow is proud to publish Dr. Ashton’s moving new book, LIFE AFTER SUICIDE, a call to arms against this dangerous, devastating epidemic and an affecting story of personal grief and loss. In her new book, Dr. Ashton opens up completely for the first time about her experience and gives an eye-opening and gut-wrenching view into the way suicide affects those left behind. 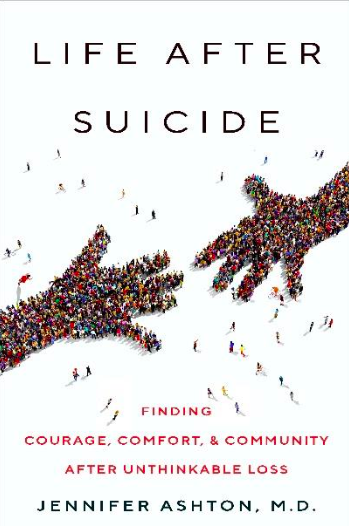 Dr. Ashton also includes interviews and stories from others who have survived the death of a loved one by suicide and offers tales of resilience, hope, healing, and courage to show how those faced with the unthinkable are able to persevere. Plus, she tackles the vital roles that conversation and community play in a loved one’s recovery. In 2017 there were an estimated 1,300,000 suicide attempts and 47,173 Americans died by suicide. That’s an average of 129 suicides per day. In 2017, men died by suicide 3.54x more often than women. Suicide and self-injury cost the US $ 69 billion annually. LIFE AFTER SUICIDE is a raw and revealing exploration of a subject that’s been taboo for far too long. This book is timely and essential in our world today and will provide support, information, and comfort for those trying to make sense of their loss and find a way to heal. ABC News’ Chief Medical Correspondent, Dr. Jennifer Ashton, is the country’s leading voice of Women’s Health. Dr. Ashton is a board-certified OB-GYN, author and is board-certified in Obesity Medicine. Dr. Ashton is a graduate of Columbia College, Columbia University. She then received her medical degree from Columbia University, College of Physicians and Surgeons, where she was elected Class President for four consecutive years. Upon graduation, she was awarded the prestigious Bartlestone Award in Pharmacology. Dr. Ashton received her post-graduate training in women’s health and surgery at St. Luke’s-Roosevelt Hospital Center in NYC, an affiliate of Columbia University’s College of Physicians and Surgeons. She served as Administrative Chief Resident and was awarded Chief Resident of the Year upon completing her residency. She received a Master of Science Degree in Nutrition from the Columbia University College of Physicians & Surgeons Institute of Human Nutrition in 2016, making Dr. Ashton one of the only M.D.’s with a national media platform who also has a degree in Nutrition. She is one of the few physicians with media platforms who still sees patients and has an active medical practice for women’s gynecology and obesity/weight management. Since 2012, she has also been the Senior Medical Contributor for Good Morning America and World News Tonight, ABC News. From 2009-2011, Dr. Ashton was the Medical Correspondent for CBS News Network, where she received the prestigious Columbia Alfred DuPont Award for Excellence in Journalism for her work. Dr. Ashton is the author of three books: Eat This Not That When Expecting, The Body Scoop for Girls, and Your Body Beautiful. Dr. Ashton also has a monthly feature column, “Ask Dr. Ashton”, in Cosmopolitan Magazine. In January 2010, Dr. Ashton travelled to Haiti with a medical team where she treated victims of the earthquake for 8 days. Dr. Ashton is a frequent keynote speaker and moderator for national events with topics ranging across all women’s health, wellness, and prevention. She is committed to improving the lives of girls and women through increasing health literacy and busting myths that have been propagated via folklore with little medical or scientific basis. She has a ‘girlfriend’s’ approachable demeanor with Ivy League credentials that combine to make her the definitive voice for Women’s Health in the modern age. As a mom of 2 teenagers, Dr. Ashton not only ‘talks the talk’ but ‘walks the walk’, proving that commitment to good nutrition, fitness, sleep and stress reduction are the cornerstones to health and wellness. With her MD, and credentials in Nutrition, along with her accomplishments as a triathlete, cyclist and fitness enthusiast, Dr. Ashton is as comfortable discussing the latest workout or diet trend, as she is counseling on cancer screening or reproductive health issues facing women.